USB to Centronics. 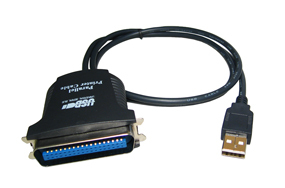 This usb to centronics adapter will allow you to connect your 36 pin Centronics printer to the USB port of your PC. Simply plug the cable into your printer and then plug into your PC with the printer connected and switched on. Windows will then find the correct driver itself. Size: The blue strip in the middle of the plug is 4cm long. Will only work on a printer. We also have USB To 25DB Female printer cable in the usb devices section of the website.